Enjoy a natural river, water massage, jacuzzi, swimming pool, plethora of eco-tourism experience! Horseback beach ride n’ swim, local lunch, Sandy Haven hotel, Negril beach followed by Ricks cafe for sunset. Pickup at 7:30am at all Negril hotels, both on negril beach road and the west end cliffe side. Enjoy reggae horseback beach ride & swim, travel to Mayfield falls and enjoy a local lunch before heading off to Negril’s seven mile beach at Sandy Haven hotel. Our last destination is Ricks cafe to watch the best sunset in Jamaica! What is the Mayfield Tour? This Mayfield Falls Combo tour is your best value for money with 5 different experiences in one day. Most visitors prefer this offer as it gives them several more hours to enjoy our warm Jamaican sea, sand and sun. The Mayfield Falls is the most picturesque Natural Waterfalls as it is nestled at the bottom of a valley and between mountains, surrounded by lush greenery, bamboo trees and over 51 different varieties of fern, 20 small natural pools and an abundance of everything found in a rainforest. The tour requires you to walk in a low river around 2-3 feet on a river banking, inhaling the different variety of flowers, medicinal plants and swimming in a natural jacuzzi where you get a massage from sections of this amazing beauty pouring over your head. The feeling is Nostalgic and truly a nature-lovers paradise. Mayfield Falls is rated as Jamaica’s best eco-tourism attraction! 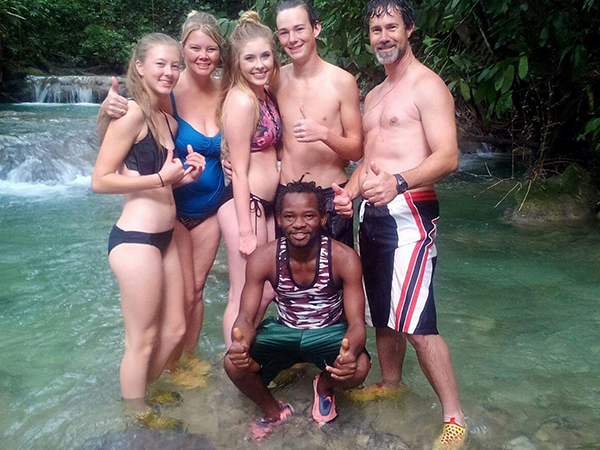 The tour pickup begins in Negril or Montego Bay at 7:30am, travelling 1-1.5 hours to the falls for 9:00am. After leaving the falls at 11:00am, we head off to reggae horseback riding for trail ride, beach ride and the famous ride n’ swim with the horses in the ocean. Photos are available with local lunch at 1:00pm. Travel to Negril seven mile beach for 2:30pm and after enjoying this beautiful white sand beach at Sandy Haven Resort, you will relax at ricks cafe to watch the most amazing sunset, cliff divers and live reggae music. You will return to the hotel for 7:30pm. Mayfield Falls is the closest waterfalls about 40 & 50 minutes drive from negril and Montego Bay respectively. An eco- tourism waterfalls, nestled in the cool mountainous region of western jamaica. 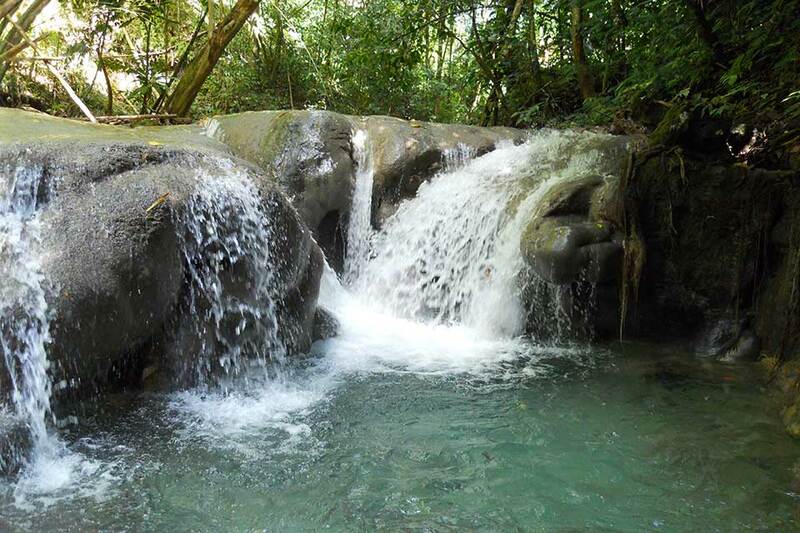 A beautiful falls with many natural pools, an abundance of ice 50 different species of ferns, many exotic & unusual flowers, birds, & butterflies that are native to Jamaica. This mountainous and fresh air atmosphere offers the most amazing sight-seeing experience. This adventure to walk in the river up to the falls, is a medium activity level and many non-athletic person has done this tour quite easily. You will enjoy this amazing experience to discover one of Jamaica’s hidden treasures but it’s NOT a tourist trap! One (1) hour guided tour. Truly a Nature Lovers Paradise ! Awesome !!! Upon reaching our famous one mile beach, you will enjoy the most picturesque views of the Jamaican south coast mountainside. 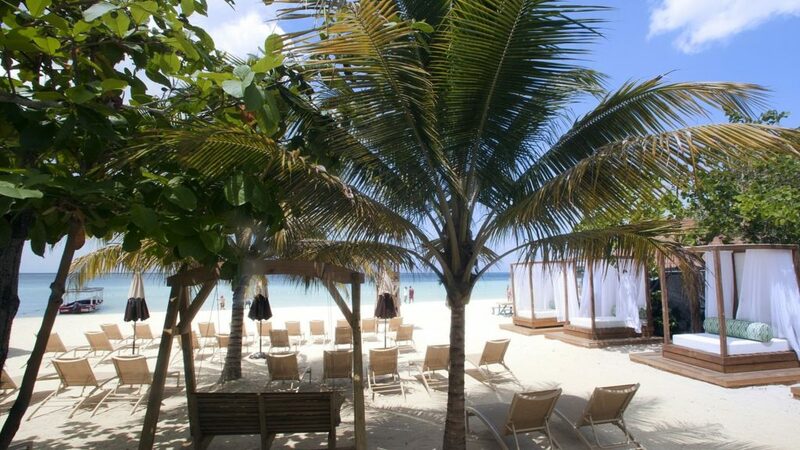 Our beach is natural and you can find sea shells and souvenirs of Jamaica on this private beach. The ride n swim is awesome. Guides will take you on our reggae horses for your first four-legged jet-ski. Come horseback ride with us and “Feel the Thrill” !!! 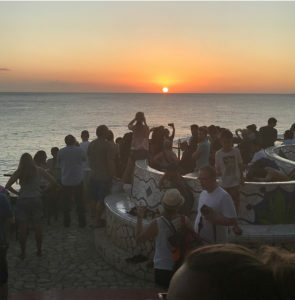 Ranked as one of the “ Top Ten Bars “ in the World- our famous Ricks Cafe since 1974 is the Best Place to catch the most beautiful sunset in Jamaica. Located at the Tip, most westerly end of the island, 60 feet above the negril Cliffs, our world famous Ricks Cafe’ is the perfect way to end your day.